Spring Break is a time when the vast majority of college students are either hitting the slopes or a pillow. However from March 17th through March 22nd, the Southern Nazarene University Tennis Team partnered with SIMS to participate in Hurricane Harvey disaster relief instead. Hurricane Harvey has been ranked the second-most costly hurricane in the history of the United States mainland since the 1900s. While the news and relief agencies seemed to be booming after the direct hit and about a month preceding the storm, the media soon moved on to the next tragedy. Most people don’t realize that residents of South Texas are still getting back on their feet nearly 7 months after the storm. Thursday morning, the team departed for some sight-seeing of the Houston area before returning back to campus. 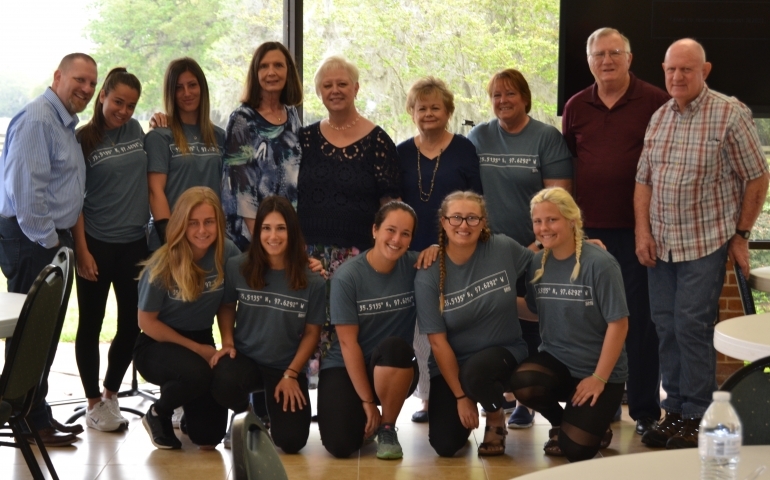 Tina Russel Hainbach, an SNU Alum and resident of Houston, not only helped orchestrate the meals at the church, but she always brought over dinner and dessert. Haibach also was able to get the girls half price tickets to the Space Center. The team’s final stop was a visit to the Gulf of Mexico in Galveston. Servant hood is what we are called to as Christians and is the mantra SNU is founded upon. SIMS enables our students and faculty to participate in acts of service and broadens narrow-mindedness. To learn more about SNU in Mission or donate to the summer mission teams, please visit: http://snu.edu/sims.